The Momotor app extends upon the assignments configured in Canvas. In order to enable Momotor processing for submissions a Canvas assignment must first be created. This assignment must have a submission type of Online with only the File uploads option enabled. 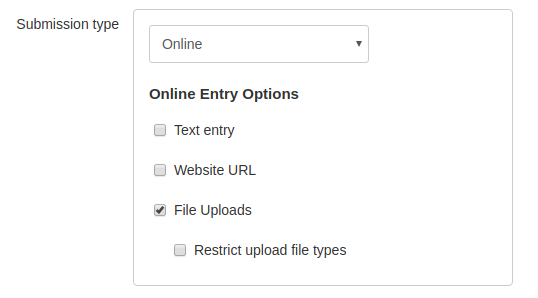 File upload types can optionally be restricted. Group assignments are supported too. Once the assignment has been created in Canvas, additional configuration is required for the Momotor processing. This can be configured from within the app by Teachers and Course Designers. Select the Momotor section in the course navigator. When there are assignments available that have not yet been configured for Momotor processing an Add Assignment button will be available on the top-right of the page. 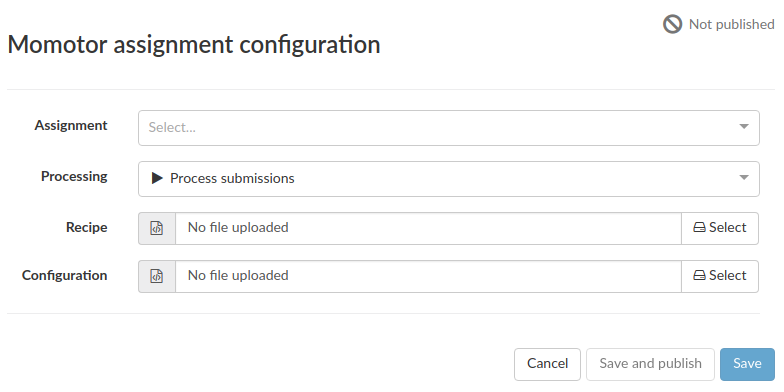 From the first drop-down field select the assignment to configure, and select and upload the Momotor recipe and configuration files for the assignment. The processing option is described later, for normal use it should remain at the default value of Process submissions. 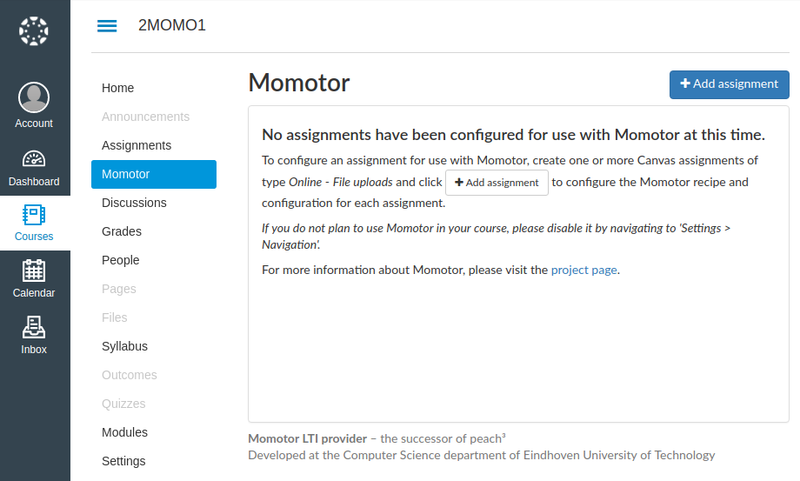 As soon as the configuration is saved, Momotor is ready to process submissions from students. If students already submitted files before the Momotor processing is configured for the first time, Momotor will start processing the existing submissions immediately. In order to process assignment submissions, Momotor recipe and configuration files are required. The format of these recipe and configuration files is explained in the Momotor Engine documentation. If you have a package from Momotor’s predecessors peach³ / daemon2, you can convert this package into a Momotor recipe using the online conversion service. Editing the configuration for an assignment is done by clicking the pencil icon on the assignments list, or selecting the ‘Configure assignment’ option from the management menu on the assignment result overview. Just as assignments in Canvas can be published or unpublished, the Momotor processing results can also be published or unpublished. Students can only see the results for published assignments. Teachers and teaching assistants can always see the results, even of unpublished assignments. Sometimes there is an unforeseen issue with a Momotor recipe. This is where the processing option is used. If a recipe is broken and processing is pointless until the recipe has been repaired, the processing can be paused by selecting the Pause processing mode in the processing drop-down on the assignment configuration screen. When a new recipe is uploaded for an existing configuration, only new submission will be processed with that recipe by default. To have Momotor process all existing submissions, select the Re-evaluate all submissions processing mode. To have Momotor process submissions that have not been processed with the most recent recipe or configuration, select the Re-evaluate submissions processed with older recipe or config mode. It is also possible to manually re-evaluate a few selected submissions, this is useful when an issue with a recipe only affects a small number of submissions. Select the Re-evaluate selected submissions processing mode and select the submissions to re-evaluate. The selected processing mode will be activated when the changes are saved.